This walkthrough was written using the DOS version. Other versions may have differences not documented here! You'll begin at the starport on the planet Arth (Planet 2 at coordinates 125,100) with 12,000 Mu, a spaceship equipped with Class 1 engines, and not much else. First, report in to the Notices section to get your briefing and a few useful clues. WE SUGGEST HOWEVER, THAT YOU AVOID THE AREA OF SPACE AROUND THE COORDINATES 135, 84 SINCE THAT IS WHERE WE LOST CONTACT WITH TWO OF OUR EARLIER SHIPS. 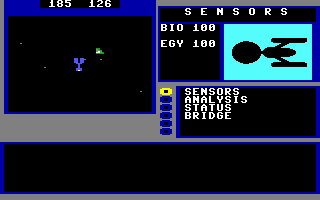 WE HAVE ALSO RECEIVED SOME INDICATION OF ALIEN ACTIVITY IN THE SYSTEM 175, 94. As your first order of business, create some crewmembers for your ship. This will allow you to get the maximum skill (250) for each of these roles, as well as let us speak to the Elowan later (they're on bad terms with the Thrynn, so they won't speak to you if you have one in your crew). You should also spend some of your money to boost your Science Officer's Science skill. Next, report to Ship Configuration. Buy a few Cargo Pods (6 should suffice for now) and name your ship (you can't take off until you do), then head to the hangar and blast off. To start out, head to the first planet in the system and find some mineable materials there. You should find plenty of Chromium, Promethium and Tungsten here, which all sell for a decent amount of money back at starport. Fill up your ship with those, then return and sell them all for a tidy profit. The third planet in the Arth system also has numerous ruins, which may have the all-valuable Endurium nearby. This fuels your ship and is by far the most expensive resource, so any you can find for free will help you out a lot. Arth-3 does have dangerous weather at times, though, so keep an eye on your crew's health. WHILE YOU HAVE BEEN AWAY IT HAS BEEN ASCERTAINED THAT THE STABILITY OF OUR SUN IS DEFINITELY DETERIORATING. HOW MUCH TIME WE HAVE UNTIL THERE IS A FATALLY LARGE FLARE, WE ARE STILL NOT SURE, BUT THERE IS LITTLE DOUBT THAT THIS WILL EVENTUALLY OCCUR. You will also now have the ability to detect incoming solar flares (which will destroy all life in a system when they occur) and have the ability to log inhabitable planets for a hefty Mu bonus. Luckily for us, one such planet happens to be very close by. Leave the station again and exit the Arth star system, then travel to the star system at 123,101. The second planet here can be logged for 30,000 Mu. Land on the second planet at the coordinates 17Nx162E and search the nearby ruins for a clue. This planet is littered with other ruins, which tend to have Endurium nearby. Search around and collect as much as you can, then return to Arth once again. You should now have enough cash to buy some more training and upgrade your ship. Ideally, we want our crew's main stats maxed out and a Class 5 engine before we go venturing out into the universe. You should easily get enough cash for this with only a few trips to Arth-1. After you've gathered enough cash to get your crew decked out and your ship equipped with top-of-the-line engines, you'll probably have gotten a few more notices. ONE OF OUR SHIPS HAS STUMBLED ACROSS SOME RUINS ON THE THIRD PLANET OF OUR OWN SYSTEM. THERE IS EVIDENCE THAT THERE MAY BE MORE. THIS MAY BE WORTH INVESTIGATING. MICROFILM -. . .REASON TO BELIEVE THERE IS A BLACK EGG DEVICE IN SOME PHLEGMAK RUINS AT 52N x 16E ON THE THIRD PLANET OF SYSTEM 238, 189. . . It'll be a while before we head out that way, but keep it in mind. For now, let's follow up a lead we got earlier about alien activity. Head to the system at 175,94. (You may encounter a Veloxi ship along the way; you probably won't be able to get much useful information from them, but be Obsequious to them for now). Shortly after entering the 238,189 system, you'll intercept a transmission from a derelict ship. THIS IS A RECORDED MESSAGE. I AM CAPTAIN SMELEMUF OF THE EMPIRE COLONY SHIP ‘LASTHOPE’. THE DATE IS 3-10-3480. MY SHIP HAS BEEN CRITICALLY DAMAGED. TWO THIRDS OF THE CREW AND COLONISTS ARE DEAD. WE HAVE PUT DOWN ON THE FIRST PLANET IN THIS SYSTEM. . . I REPEAT. . . WE HAVE BEEN FORCED TO PUT DOWN. WE WILL BE AT COORDINATES 22N x 97W. WE WILL SURVIVE FOR AS LONG AS WE CAN. I JUST HOPE YOU’RE NOT TOO LATE. SMELEMUF OUT. Continue to the coordinates specified in the message and you'll find a ruin. Search it to find another message. CAPTAIN’S LOG ENTRY - OCTOBER 31, 3480 - WE HAVE MANAGED TO SET UP A CAMP OF SORTS HERE, AND HAVE ENOUGH SUPPLIES TO KEEP US ALIVE FOR SEVERAL MONTHS. WE WERE ON OUR WAY TO ESTABLISH THE NOAH 9 COLONY WORLD OF ‘HEAVEN’ WHEN THE SHIP BLEW. THE MECHANS ARE CURRENTLY IN PREPARATION PHASE CODE BLUE. OUR ARRIVAL WOULD HAVE INITIATED CODE RED, AND WE WOULD HAVE TAKEN CONTROL OF THE MECHANS. I BELIEVE OUR SHIP WAS SABOTAGED BY THE LAYTONITES, DAMN THEM. HALF OF MY CREW IS DEAD. THEIR BOMB BLEW OUT THE ENTIRE AFT QUARTER SECTION OF THE SHIP. I DON’T KNOW HOW WE MADE IT DOWN TO THE SURFACE IN THAT DEFECTIVE POD. I JUST HOPE OUR LUCK HOLDS OUT. CAPTAIN OUT. Mechans, eh? Maybe we should follow up on that other lead about the androids. Head back to Arth, then continue about 20 sectors coreward (right) to 145,107. You'll soon be confronted by the Mechans, who will ask you a series of questions. Once you've convinced them that you're the person they've been waiting for, they'll happily answer your questions. (Getting it wrong will cause them to attack). Ask them about everything you can and they'll provide you with many important clues. THE COLONY WORLD OF HEAVEN, THE 4TH PLANET, HAS A CAPACITY TO SUPPORT SEVERAL HUNDRED THOUSAND COLONISTS. IT AWAITS YOU. THE SPEMIN WERE DISCOVERED IN SYSTEM 82, 148 IN 2675. THEY WERE IN A PRE-TECHNOLOGICAL STATE. THE EMPIRE PUT A LOT OF EFFORT INTO TEACHING THE SPEMIN THEIR SCIENCE AND TECHNOLOGY. THE VELOX EMPIRE IS UPSPIN OF HERE. THEY ARE ARROGANT AND SINCE 3330 HAVE HAD AN ISOLATIONIST ATTITUDE. THE THRYNN AND ELOWAN WERE DISCOVERED ON DIFFERENT PLANETS IN A K CLASS SYSTEM WITH 5 PLANETS DOWNSPIN OF HERE. THE THRYNN HAD A MORE ADVANCED TECHNOLOGY AND OFTEN ATTACKED THE ELOWAN PLANET. DURING THE WARS WITH THE PHLEGMAK, MANY WORLDS OF THE EMPIRE WERE DESTROYED BY THEIR BLACK-EGG PLANET BOMBS. THE ENTIRE ECONOMY OF THE EMPIRE IS BASED ON ENDURIUM. WHEN WE LEFT, THE RICHEST AND STRONGEST PLANET WAS NEW SCOTLAND, THE SECOND PLANET IN THE UPSPIN END OF THE STAFF CONSTELLATION. THE STRANGE CRYSTALLINE LUMPS OF ENDURIUM ARE ALWAYS FOUND IN ANCIENT RUINS. RUINS OF THE ANCIENTS HAVE BEEN FOUND ALL OVER SPACE, BUT PRIMARILY SEEM TO BE IN M-TYPE SYSTEMS. THEY ARE MANY HUNDREDS OF MILLIONS OF YEARS OLD. THE INSTITUTE, BASED AT 75S x 66E ON AKTERON 6 STUDIED THE ANCIENTS INTENSELY. THERE WAS MUCH CONTROVERSY SURROUNDING THEIR FINDINGS. THEY OFTEN WORKED WITH THE ELOWAN. IT IS BELIEVED THAT THE DEVICE KNOWN AS THE CRYSTAL PLANET WAS BUILT BY THE ANCIENTS. THE INSTITUTE DISCOVERED AN INCREASE IN THE INSTABILITY OF STARS COREWARD. THERE ARE MANY REFERENCES IN OUR DATA BANKS TO THE ENCROACHING ‘DEAD ZONE’. SOL IS OF COURSE IN THE PYTHAGORAS CONSTELLATION. EARTH DID MOST OF ITS MINING ON MINERAL RICH MARDAN-4, ALSO IN PYTHAGORAS. THE INSTITUTE HAS A STARFLIGHT RESEARCH STATION AT THE CENTER OF THE NORTH POLE ON MARS. WE HAVE FOUND EVIDENCE OF EMPIRE RUINS AT 28N x 4E ON ONE OF THE PLANETS IN THE NEARBY CLASS-G SYSTEM. WE HAVE BEEN UNABLE TO INVESTIGATE HOWEVER BECAUSE IT IS WITHIN VELOXI SPACE AND IS GUARDED BY A DRONE. Looks like we'll have to pay the Veloxi and the Elowan a visit at some point. For now, head to the fourth planet in the system (Heaven) and be sure to log it for a cool 50,000 Mu. Heaven is also an excellent place to find materials and Endurium; you can easily earn upwards of 50,000 Mu per trip with a ship that has a full complement of cargo pods. In fact, you should do this now in order to get your ship and crew fully decked out. You'll find the Dodecahedron inside these ruins as well; this is a transmitter that makes encounters with aliens occur much more frequently than normal (which is actually a good thing when you're trying to negotiate with them). This planet can also be logged for 40,000 credits. Arm your weapons and shields and head for 68, 66; and you'll encounter a single Gazurtoid ship near Planet 1 when you attempt to orbit. The Gazurtoid are fanatics and can't be reasoned with, so just get in close and blow him away with your lasers (they are immune to missiles). Once he's out of the way, land on the planet. This planet is incredibly dense with life, which makes the game slow down quite a bit. There is also plenty of Endurium around, but whatever you do, you must not pick up any minerals here - they are bugged and will hang the game when you return to your ship (which will also render your save file unusable). Collect as many lifeforms and as much Endurium as you like, but leave any mineral icons you find alone. Search around for random ruins, which contain two more clues. Following up on the former, you'll find some ruins on this planet at 12Nx32E that contain the Shimmering Ball. When identified at Arth, this will work as a cloaking device that prevents enemy missiles from locking onto your ship; I'm sure you can see the value in that. Stop back by Arth to sell lifeforms, identify artifacts and restock fuel if needed, then continue to 216,87 and you'll find three systems here - one with three planets, one with six and one with eight. Visit the one with six first. Mardan-4 is another important location; it is extremely rich in valuable minerals (even moreso than Heaven) and can be logged for a whopping 50,000 Mu on top of that. Be sure to do that before you go. Next, head for the star with eight planets surrounding it. That points you back to the base on Mardan-2, so if you find one of these areas you'll find the other as well. This ruin also contains the Hypercube, which has no purpose as far as I can tell (but sells for 15,000 Mu once identified). Exit Earth when you're done and head for Mars (4th planet). Head to the coordinates 90Nx0E (the "center of the North Pole) and touch down to find another outpost. Inside you will find the Ring Device, which will display nearby Fluxes on the hyperspace map (useless if your Navigation skill is over 200, but you can sell it for some cash if you wish). The Mechans mentioned New Scotland to us, which is in the "Staff constellation". The Veloxi may have also mentioned a "Captain Harrison" to you, who stole a sacred artifact from them. There's no clues that point to the Staff constellation's explicit location, so you'll have to search the star map for this one. On the right-hand side of the map, near the center, you'll see three stars stacked vertically; that looks like it might be worth investigating. REPORT - . . . HAVE FINALLY LOCATED HARRISON’S BASE OF OPERATIONS ON NEW SCOTLAND, AND ONCE AGAIN HE’S A STEP AHEAD OF US. WE BELIEVE HE MAY HAVE RELOCATED AT 44S x 137W ON THE FIRST PLANET OF SYSTEM 81, 98. WE WILL PROCEED TO. . . Following up on that, we find Harrison's home base, where we discover the Ellipsoid. This is a holy artifact to the Veloxi, and returning it to them will immediately put them on good terms with you. Harrison also knows how to pick 'em, as this planet can be logged for 50,000 Mu. With the Ellipsoid in hand, we can immediately get on good terms with the Veloxi. (The other option is to constantly be obsequious to them and gift them tons of Endurium over the span of many, many encounters, so I much prefer the faster method). Head into Veloxi territory (around 150,148 on the map), give them the Ellipsoid and they will be willing to talk with you, divulging numerous useful clues in the process. PHLEGMAK AND NUMLOX IS DEAD THE RACES. SUPREME VELOXI IS KILL. LAST BATTLE BEING 3250 AT PHLEGMAK BASE AT 35S x 99E ON SECOND PLANET IN HANDLE OF AXE MOST ASSUREDLY. IN OLD TIME EMPIRE WAS HAVING BASE IN VELOXI TERRITORY AT 28N x 4E FIRST PLANET OF YELLOW SYSTEM AT 143, 115. THIS PLANET ARE FORBIDDEN HOWEVER. WE IS REMEMBER RUINS OF OLD EMPIRE BEING AT 34N x 28E ON ICE PLANET OF DOWNSPIN SYSTEM IN STAFF CONSTELLATION. VELOXI EXPLORATION IS FIND THE LONG TIMES AGO. THE GREAT EGG AT 192, 152 IS MADE BY ANCIENTS. IT IS OF COURSE LOOKING LIKE BIG VELOXI EGG EXACTLY. THE MOST MAGNIFICENT HEXAGON ON SACRED PLANET SPHEXI IS A SIGN FROM ANCIENTS TO WONDERFUL VELOXI DESCENDANTS. THE SMALL EGG IS THERE. MOST SACRED OF VELOXI POSSESSIONS ABSOLUTELY. SPHEXI IS FIRST PLANET AT 132, 165 STAR. THE MOST MAGNIFICENT HEXAGON IS OF COURSE SIGN TO VELOXI FROM ANCIENTS OF HOLY NUMBER 6. MOST PERFECT OF ALL NUMBERS. OF COURSE VELOXI ARE 6 LEGS, THE ONLY RACE. Next, head to Elowan space (around the area of 148,63) and talk to them. You'll have to answer questions to their satisfaction before they'll talk to you, and they won't deal with you if you have any Thrynn crewmembers aboard your ship. Once they're convinced of your sincerity, you'll be able to get a lot of useful information from them. THE ORANGE STAR OF OUR BIRTH, AT 129, 33, WAS NAMED ELERAN, AND BY THE THRYNN THOSS. AND UPON THE SECOND PLANET DID WE DWELL, AND THEY UPON THE FOURTH. THE SPEMIN KNOWEST LITTLE AND MOSTLY DO THEY BLUSTER. UPON PAMPERING SHALT THOU APPEASE THEM, BUT THAT WHICH IS USEFUL SHALT THOU GAIN’ST ONLY BY FORCE. THE UHLEK ARE A RACE LIKE NONE OTHER. AS IF CELLS OF ONE LARGE CREATURE, AUTONOMOUS YET ONE, THEY ARE POSSESSED OF A SINGLE MIND WHICH RESIDES APART FROM THEM, BURIED DEEP IN SUBTERRANEAN CAVERNS. ‘TIS NOT KNOWN WHETHER ANY ANCIENTS ONES SURVIVE STILL. MAYHAP ONLY THAT HEINOUS LEGACY, THE CRYSTAL PLANET, HAS BEEN LEFT US. ITS EVIL TASK IS TO DESTROY ALL THAT LIVES. WHY, WE KNOW NOT. UPON APPROACHING THE CRYSTAL PLANET, IT DOTH UNLEASH A MIGHTY FORCE, SO TAKE CARE. ONLY THE POSSESSION OF A CERTAIN DEVICE WILL STAY THIS. THE NATURE OF THIS DEVICE WAS PERCHANCE KNOWN TO THOSE OF THE INSTITUTE, BUT IT IS UNBEKNOWNST TO US. ‘TIS KNOWN TO US THAT UPON THE CRYSTAL PLANET THERE IS ONE PLACE ONLY THAT IS VULNERABLE TO ATTACK. OFT HAVE WE TRIED AND FAILED, FOR EVEN THIS NEXUS OF CONTROL IS ALL BUT IMPREGNABLE. IF THOU WOULDST MAKE ATTACK UPON THE ANCIENT PLANET OF CRYSTAL FIRSTLY MUST THOU FIND THE NEXUS OF CONTROL. TO DO THIS THOU WOULDST REQUIRE THAT WHICH IS LOST, THE CONE OF CRYSTAL FASHIONED BY THE ANCIENT ONES. THE SUN OF THE PLANET THOU CALL’ST ARTH SHALL FLARE IN THE FINAL WEEK OF YOUR TEN-MONTH OF THIS YEAR, SO WE HAVE ASCERTAINED. AKTERON, GAAL, IRIDANI, AND ECHT. THESE ARE THE SUNS OF THE FOUR SEEDLINGS, A CONSTELLATION IN OUR DEMESNE OFT USED AS A LANDMARK BY OUR PEOPLE. AS OUR YOUNG PLAY OFTEN DO THEY SING SONGS SUCH AS THIS- SOMEDAY TO THE GROUND WILL FALL, IRIDANI, ECHT, AND GAAL. UP THEY’LL GROW WITH BRANCHES TALL, THEN TO AKTERON THEY’LL CALL. AND AT LAST IT TOO WILL FALL, THE BRIGHTEST SEEDLING OF THEM ALL. Next, head to Spemin territory (Around 82, 148) and give them the Hostile treatment; failing that, destroy some of their ships and they will surrender, giving you some more useful clues. THE MIND-GANGLION PLANET OF THE UHLEK IS THE LIFE-BEARING PLANET IN THE SYSTEM 55, 32. DESTROYING IT SHOULD BE A TRIVIAL TASK. WE ARE ALMOST TEMPTED TO DO IT OURSELVES. THERE ARE MANY RUINS OF THE ANCIENTS IN SPEMIN TERRITORY. IN FACT, THERE IS A GREAT CITY OF THE ANCIENTS IN A NEBULA JUST OUTWARD OF OUR HOME PLANET. OF COURSE THIS IS SECRET, AND ANY SPEMIN WOULD DIE BEFORE HE WOULD REVEAL THIS. THERE IS A SECRET WAY INTO UHLEK TERRITORY. THE FIRST JUMP POINT IS AT 106, 139. THE SECOND IS AT 64, 186. AND THE THIRD IS AT 35, 186. DO NOT TRY TO DO THIS THOUGH. ANYONE BUT A MASTER SPEMIN NAVIGATOR WOULD GET LOST. From here, we'll want to do some item hunting by following up on the clues we've been given. Black Egg #1 - In a random ruin on the third planet of the Arth system, a clue points you to the system 238,189 and the coordinates of 52Nx16E on the third planet. Head there and pick up the egg. Black Egg #2 - The Veloxi mentioned an empire base at the coordinates 143,115, so head over there and visit the first planet. Before you can land, however, you'll be confronted by a Veloxi drone, which will ask you a series of number questions. We now also know that six is a sacred number to the Veloxi, so answer "Yes" to any number that is a multiple of 6 and "No" to any that aren't. After a few of these, the probe will let you pass. Land at the coordinates 28Nx4E and you'll find the Black egg. Black Egg #3 - The Veloxi gave us some other coordinates as well: 35Sx99E on the second planet in the handle of the "Axe". There is no text clue to the Axe constellation's location, so you'll have to search the star map again; it's in the bottom-right corner. Head to 234,20 and search at those coordinates to find a third Black Egg. (You only need two to complete the game; the third you can use however you wish). Red Cylinder - This is necessary to locate the last few items, as there is no in-game indication of their planetary coordinates. To start, follow up on some of the coordinates given to you by the Elowan. We know that the Institute were on friendly terms with the Elowan and had an outpost on their former homeworld of Eleran (129, 33). Head to Eleran first and examine the ruins at 60sx45E. That's that sorted. Unfortunately, these coordinates are deep within Uhlek territory and heavily guarded. Thankfully, the Spemin have also revealed the location of the Uhlek's mind-ganglion, which, when disabled, will render the Uhlek harmless. Head for the system at 55,32 (use the Fluxes the Spemin told you about to get there with less conflict), drop a Black Egg on the second planet, and fly off. That will remove all of the Uhlek from the game. Now you can head to 59Nx64W relatively unimpeded and collect the Red Cylinder, which points out ruins containing important artifacts on the orbital map. Tesseract - Continuing on from the above, head to coordinates 118,50, Planet 5, 15Nx44W and search the ruins there for the Tesseract. This cuts your fuel consumption in half whilst in Hyperspace. Crystal Pearl - The Spemin mentioned a city of the ancients in a nebula just outward of their home planet. There are two small nebulae left of their home system (82, 148), but only the lower nebula of the two contains a star. Head there (56,144) and the Red Cylinder will point out the location 29Nx13W. Head there and collect the Crystal Pearl, which will allow instant escape from an encounter when your ship is critically damaged and you select the "Maneuver" command. By now we've seen much mention of the Ancients and the Crystal Planet that is steadily causing stars to flare, wiping out all life in their vicinity. The Veloxi speak of a prophecy about it, Earth and several other homeworlds have already been destroyed by it, and Arth is currently threatened with another flare, hence our current mission. The Veloxi have told us of the Crystal Planet's coordinates, but we are unable to approach - attempting to orbit it causes our ship heavy damage. The Institute was also researching it before they were largely wiped out, and the Mechans make mention of a base on Akteron near the old Elowan homeworld, but nobody has specific coordinates. We'll have to decipher a string of clues to figure this one out. Akteron is one of the "Four Seedlings", a constellation near the Elowan territory, and is said to be the "brightest of them all". It's not visible on the star map, but hidden within a nearby nebula is a cluster of four stars in a square formation. Three of them are Class B stars and one is a Class O star, the "brightest of them all". Head to that star (coordinates 165,84) and make your way to the sixth planet. Land at the coordinates 75Sx66E to find some ruins. “REPORT - PROJECT TELEPORT, 1-2-3380 - . . . IN SHORT WE HAVE DEVISED A SCHEME TO TELEPORT AN OPERATIVE FROM A SPECIALLY BUILT STARBASE (WHICH WILL BE KNOWN AS CRYSTAL BASE 1) TO THE SURFACE OF THE CRYSTAL PLANET. BECAUSE OF THE PROBLEMS INVOLVED WITH A TELEPORTATION OF THIS DISTANCE WE WILL NOT BE ABLE TO RETRIEVE THE OPERATIVE. THE VOLUNTEER WILL BE SENT IN WITH A NUCLEAR EXPLOSIVE. IF POSSIBLE HE WILL STAY IN COMMUNICATION WITH THE STARBASE. HE WILL LOCATE AND DESTROY THE CONTROL CENTER OF THE CRYSTAL PLANET. POTENTIAL PROBLEMS INCLUDE - TELEPORTATION RELIABILITY, INSUFFICIENT EXPLOSIVE POWER, COMMUNICATIONS THROUGH THE MAGNETIC FIELD GENERATED BY THE PLANET, LOCATION OF. . .
COMMUNICATION TRANSCRIPT - CRYSTAL BASE 1 TO AKTERON INSTITUTE, 8-8-3382. . . BEEN 14 HOURS SINCE COMMANDER MCCONNELL WAS SENT DOWN. AT NO POINT HAVE WE RECEIVED ANY COMMUNICATION FROM HIM. AT EXACTLY 12 HRS AND 11 MINUTES AFTER HIS DEPARTURE WE WITNESSED AN EXPLOSION ON THE PLANET’S SURFACE. WE ARE NOW SENDING OUT DRONES TO TEST THE DEFENSES OF THE CRYSTAL PLANET IN AN ATTEMPT TO ASCERTAIN THE EFFECT OF THE EXPLOSION. . .
We've already dealt with the Uhlek, so that shouldn't be a problem. Head to 20,198's first planet and search the ruins at 29Sx55W to find the Crystal Cone. The Crystal Orb is a bit more problematic. Talking to the Veloxi while on good terms with them will cause them to talk about the "magnificent Hexagon" on planet Sphexi, and give you the coordinates of that planet (132, 165). Head that way and you'll be confronted by a horde of Veloxi probes. As you did before, answer "Yes" to multiples of 6 and "No" to any other number and they will let you pass. The Red Cylinder will point out its location on the map, at coordinates 46Nx14E. Grab it and leave. Oh, and if you run into any more Veloxi ships after this point, they will demand that you return the Orb to them. DO NOT DO THIS as it will make the game unwinnable. You will unfortunately have to fight or flee from any Veloxi you encounter from this point on. With both of these in hand (as well as at least one Black Egg), we can finally make our way to the Crystal Planet. Head to coordinates 192,152 and you should be able to spot the location of the Nexus on the orbital map. Land there and enter the nexus to find one final note. “LOG ENTRY 8-8-3382, COMMANDER MCCONNELL, ENTRY 1 - I HAVE SUCCESSFULLY TELEPORTED TO THE CRYSTAL PLANET! I AM DIZZY AND HAVE EXPERIENCED A PROFOUND SENSE OF DISORIENTATION BUT OTHER THAN THAT I SEEM TO BE FINE. THE CONTROL NEXUS IS VISIBLE FROM HERE. ENTRY 4 CONT.- I CAN HARDLY BELIEVE IT! THOSE WEIRD LUMPS ARE ACTUALLY INTELLIGENT LIFE. THE ANCIENTS ARE ENDURIUM! AND WE HAVE SPENT HUNDREDS OF YEARS HUNTING THEM TO BURN FOR FUEL IN OUR SHIPS. ENTRY 4 CONT.- THEIR METABOLISM IS SO MUCH SLOWER THAN OURS THEY LIVE IN AN ENTIRELY DIFFERENT TIME FRAMEWORK. I DON’T THINK THEY EVEN KNOW WE ARE SENTIENT. I BELIEVE IT WAS ONLY BECAUSE OF A LINK THRU THE CRYSTAL PLANET THAT CONTACT WAS MADE AT ALL. With that revelation, it's little wonder that the ancients want to wipe us out - we've unknowingly been killing them in vast numbers, and they've simply reacted in self-defense. Unfortunately, as McConnell notes, there is no chance of communication, much less negotiation, with them; one of us has got to go in order to ensure the other's survival. With that in mind, drop the Black Egg atop the nexus, board your ship and escape. An ending sequence now plays (Oddly, you still get this scene even if Arth has already been wiped out by a solar flare...). Upon your return to Arth you will earn a hefty bonus of 500,000 Mu and the freedom to continue exploring the galaxy at your leisure. The Minstrels - During your journeys, you may occasionally encounter an odd, spiral-shaped race known as the Minstrels. They will not respond to your communications and will endlessly repeat their tale each time you encounter them.
. . . TIME, IT SEEMS, DOESN’T FLOW. FOR SOME IT’S FAST, FOR OTHERS SLOW. IN WHAT TO ONE RACE IS NO TIME AT ALL, ANOTHER RACE CAN RISE AND FALL. . .
. . . AND HARDER STILL TO RECOGNIZE THAT WHICH LIES BEFORE ONES EYES. SO MANY RACES HAVE BELIEVED IN ONLY WHAT WAS PRECONCEIVED. THAT WHICH IS ANCIENT MAY BE NEW, IT ALL DEPENDS ON POINT OF VIEW. . .
. . . THE VIRUS SPREAD LIKE BURNING FIRE, THE SEA OF DREAD ROSE HIGHER AND HIGHER. THE CRYSTAL ONES HAD TO FIGHT BY CAUSING SUNS TO IGNITE. SELF-DEFENSE, IT IS THEIR RIGHT. . .
. . . FROM INWARD OUT THE RACES FLEE, SEARCHING FOR A PLACE TO HIDE. EVER IN A WAVE OF WAR, AND ON THE CREST THE STRONGEST RIDE. So they basically give away the entire main storyline. According to rumor, this was once either the home office number of one of the game's developers or an alternate phone number at Binary Systems. In the Sega Genesis version of the game, the Mysterions give a different message. These are the coordinates for the Red Cylinder and the Hypercube, respectively. Unsurprisingly, this also causes the surviving Elowan to declare war on your race. You may encounter a ship that strongly resembles the USS Enterprise of Star Trek fame in your travels. Unfortunately, you cannot communicate with it and its crew will immediately open fire on you when you find it, forcing you to either fight or flee. Its location seems to be completely random.